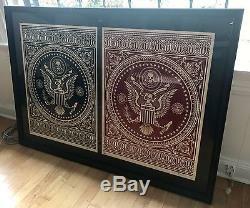 Up for sale is an extremely rare 2007 Shepard Fairey Obey Presidential Seal Signed Matching Pair 197/300. Not only did this limited edition screen print/silkscreen sell out immediately upon release, but to have both the Red & Black variations of this together [along with matching prints] is almost unheard of. Prints are 18x24 and the pictures simply dont do it justice. 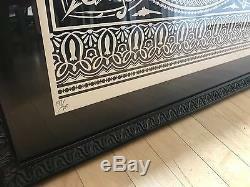 The frame is stunning and the glass is gallery quality with UV protection. 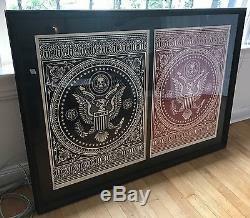 The item "Shepard Fairey Obey Presidential Seal Limited Edition Signed Matching Pair 2007" is in sale since Friday, April 21, 2017. This item is in the category "Art\Art Prints". 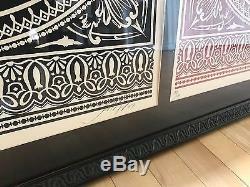 The seller is "bigevilcorp" and is located in Sherman Oaks, California. 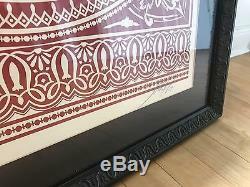 This item can be shipped to United States, United Kingdom, Denmark, Romania, Slovakia, Bulgaria, Czech republic, Finland, Hungary, Latvia, Lithuania, Malta, Estonia, Australia, Greece, Portugal, Cyprus, Slovenia, Japan, Sweden, South Korea, Indonesia, South africa, Thailand, Belgium, France, Hong Kong, Ireland, Netherlands, Poland, Spain, Italy, Germany, Austria, Israel, Mexico, New Zealand, Singapore, Norway, Saudi arabia, Ukraine, United arab emirates, Qatar, Bahrain, Croatia, Malaysia, Panama, Jamaica, Barbados, Bangladesh, Bermuda, Brunei darussalam, Bolivia, Ecuador, Egypt, French guiana, Guernsey, Gibraltar, Guadeloupe, Iceland, Jersey, Jordan, Cambodia, Cayman islands, Liechtenstein, Sri lanka, Luxembourg, Monaco, Macao, Martinique, Maldives, Nicaragua, Oman, Peru, Pakistan, Paraguay, Reunion, Bahamas, Viet nam.